Coreas Hazells Ltd has introduced an environmentally friendly cement which is designed to reduce wastage and eliminate the need to dispose of cement bags. 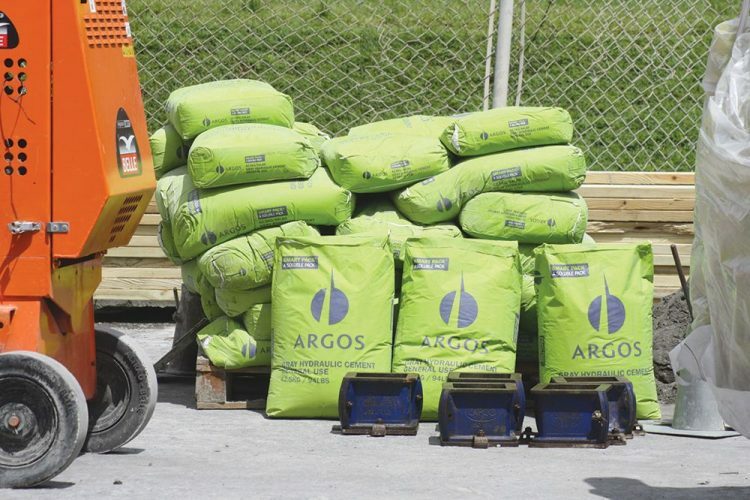 The brand, packaged by the Argos cement company in Colombia, allows construction workers to place the entire sack of cement, including the packaging, into the mixer without affecting the strength of the mix. The bag dissolves into the mix. The Argos smart pack was introduced to local contractors on Tuesday at Coreas Diamond Woods facility. Vouching for the smart pack, Richard Hutchinson of Hutchinson Construction Limited, who has been in the construction business for over 30 years, said that the Argos smart pack is a great innovation that will benefit the construction industry here. He said he tested the product in January, using the indigenous aggregate (Rabacca stone and sand) and it passed all tests. âWe tested it over a week using the dissolvable bag and we didnât lose any strength, we gained more time and it maintained the strength. We looked at it for about 28 days. We did the testing ourselves to be sure to substantiate whatever the manufacturer is saying; we videotaped it and got all the results. âI believe it is a no-brainer; you donât have a huge waste product and the disposal cost is gone. Adding fibre to concrete only increases the strength,â said Hutchinson. Division manager Building Supplies at Coreas Brian George said that Argosâs innovation has several environmental benefits and reduces construction time. He said that the smart pack comes in the traditionally supplied 42-kg bag. George said that the benefits include the reduction of cement dust getting into the atmosphere, faster mixing times and the elimination of waste. âWe believe that it will significantly change the way many persons conduct casting activities. We do a lot of reinforced concrete work here and it will benefit it considerably,â said George who revealed that SVG is the first country in the Caribbean to use the smart pack. âI have been involved in the industry for over 20 years and disposal has always been a problem, these bags accumulate, hold water, breed mosquitoes and the cost to pay a labourer to collect the bags is there, so this new bag is great and it reduces the amount of cement in the air,â added George. Argos has absorbed the cost of the new packaging, so the price is maintained locally at EC$20.10. Argosâ technical director Jocelyn De La Cruz, who journeyed to SVG with a team to demonstrate how the smart pack works, said that the new packaging does not affect the properties of the mix. She said that the packaging was designed in Europe and the mix is bagged in Colombia.